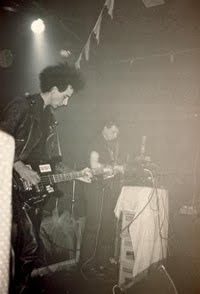 Today’s post contains a handful of selected tracks by British darkwave act Nagamatzu, essentially a two piece featuring Andrew Lagowski (Legion, Terror Against Terror) on synths, guitar, and drum machines and Stephen Jarvis (aka Terraform) on bass, synth, and projections. Andrew Fleck also contributed keyboards from 1982-1983. A good portion of these tracks appear on the band’s debut cassette release, 1986’s Sacred Islands of the Mad, a true minimal synth classic. In fact, all of the tracks are represented here, except “Lift Off,” the first track on the cassette. To make up for it, this collection contains three other tracks, including “Crackle Black,” “Op-Dead Post A,” and “Shroud,” only one whose origin is known. All tracks sound nice and crisp, as loud and clear as can be. Track 7 from Total Recess 3 comp. ATTENTION, dear readers- you can now get a remastered copy Sacred Islands of the Mad via the always excellent DARK ENTRIES label, an awesome reissue label based out of the west coast. Click here for more info! This entry was posted on January 15, 2010 at 7:27 pm and is filed under 1980s, 1986, coldwave, minimal, minimal synth, Nagamatzu, uk . You can follow any responses to this entry through the RSS 2.0 feed You can leave a response, or trackback from your own site. In love with this. thanks! A good portion of these tracks appear on the band's debut cassette release, 1986's Sacred Islands of the Mad, a true minimal synth classic. Thank you. I just ordered the LP. Thank you for your interest in our music, but please will you remove the downloads from the site.